Here is the list of the hotels near Savigny. Book your hotel near Savigny today, Tuesday 14 May for the best price, reservation and cancellation free of charge thanks to our partner Booking.com, leader in on-line hotels reservation. Below here is the list the 50 closest hotels of Savigny, sortable according your criteria. You will find the position of these accommodations on the Savigny hotels map. Offering free WiFi and free-use bicycles, Villa Haute Savoie is located in Chessenaz. This self-catering accommodation is 40 km from Geneva and 35 km from Annecy. This holiday home will provide you with a seating area opening onto a furnished balcony as well as a large furnished terrace with barbecue facilities and a blow-up swimming pool in the garden. Guests can enjoy mountain and garden views. The fully equipped kitchenette comes with a dishwasher and a microwave/oven. There are 2 bathrooms, one features a bathtub with shower attachment. Activities in the surrounding area include hiking and fishing . Free parking is available on site. Geneva Palexpo is 35 km away. La Ferme de Cortanges is located in the Rhône-Alpes region, a 25-minute drive from Geneva and Annecy. It offers en suite accommodation, free parking and free Wi-Fi. Rooms are uniquely decorated and equipped with a flat-screen TV. Each room has a private bathroom with a shower and a hairdryer. A communal kitchen and microwave are available to guests, as well as a barbecue. Guests are invited to relax in La Ferme’s lounge or explore the garden. The area is popular for hiking. The nearest airport is in Geneva, 27 km from the property. Featuring free WiFi, a seasonal outdoor pool and a barbecue, Domaine Privé le Parc offers homestay accommodation in Viry. The room has access to a shared bathroom and a shared toilet. Fruits, a coffee machine and a bottle of water are provided in the room. A shared kitchen and a shred living room with a TV are available. Geneva is 14 km from Domaine Privé le Parc, while Annecy is 24 km away. Chambéry-Savoie Airport is 54 km from the property. Situated in Viry, hotelF1 Genève Saint Julien en Genevois provides free WiFi. The units in the hotel are fitted with a TV. Rooms come with a shared bathroom. All units feature a desk. A buffet breakfast is available daily at hotelF1 Genève. Guests can purchase microfibre towels at the hotel at an extra cost of EUR 3 each. Geneva is 13 km from the accommodation, while Annecy is 26 km from the property. Chambéry-Savoie Airport is 55 km away. La Colonie is located in Collonges, in the Haut Jura Natural Park area. It is set in a building dating from 1801, renovated in 2013, just 2 km from Fort l'Ecluse. Guests can use the communal kitchenette. All rooms offer a view, a flat-screen TV and free Wi-Fi access, while the family room also features a balcony. The private bathroom is complete and comes with free toiletries. A continental breakfast including local products is served every morning. Meals and packed lunches can be prepared upon request at an additional cost and staff are happy to recommend restaurants in the area. Activities like skiing, hiking and biking can be enjoyed in the surroundings. Château de Voltaire is 24 km away and Geneva is 28.5 km away. The property offers free parking. Hotel Saint-Blaise Preferred hotel ! Hotel The Originals Rey du Mont Sion Saint-Julien-en-Genevois Sud (ex Inter-Hotel) sits at an altitude of 800 metres at the foot of the Salève Mountain. It is a 20-minute drive from Palexpo Convention Centre, Geneva airport and Lake Annecy. Hotel The Originals Rey du Mont Sion Saint-Julien-en-Genevois Sud offers an outdoor swimming pool, free WiFi and free parking. It is a convenient stopover on the way to ski resorts in the Alps. The charming guest rooms are equipped with an en suite bathroom, flat-screen HD TV and a telephone. Rooms are accessible by lift and are 100% non-smoking. Hotel The Originals Rey du Mont Sion Saint-Julien-en-Genevois Sud is set in a big garden with a tennis court. Additional services include a lounge bar and various breakfast options. Next door there is a gourmet restaurant. The Domaine des Avenières is located in the countryside between Annecy and Genève. This 4-star hotel features a golden mosaic chapel and has a hammam, hot tub and an ornamental lake. The Domaine des Avenières offers rooms and suites with satellite TV, a sitting area and free Wi-Fi access. Some suites also feature a balcony or terrace overlooking the surrounding forest and valley. The Domaine des Avenieres provides free private parking and is next to the A41 motorway. Offering free Wi-Fi access in the guest rooms, this 2-star hotel is located opposite Bellegarde Train Station. You can enjoy a drink in the bar and a buffet breakfast is prepared every morning. A minibar and a TV with satellite channels are provided in the colourful rooms, which are individually decorated. The private bathrooms are fitted with a bathtub or a shower. Additional facilities include luggage storage and daily newspapers. The Jura Mountains are a 15-minute drive away and free public parking is available nearby. You can visit Geneva, located 40 km from the hotel. Guest accommodation Choisy Preferred hotel ! Les Haies Vives is a homestay property located in Choisy, 25 km from Geneva and 12 km from Annecy. Free private parking is available on site. Rooms include a private bathroom with a private toilet located on the corridor. Les Haies Vives features free WiFi throughout the property. Megève is 46 km from Les Haies Vives, while Aix-les-Bains is 36 km away. The nearest airport is Chambéry-Savoie Airport, 42 km from the homestay. Le Sorgia offers accommodation in Lancrans. The rooms have a flat-screen TV. Every room is equipped with a private bathroom with a bath or shower. There is a closed garage available for motorcycles and bicycles. Geneva is 40 km from Le Sorgia, while Annecy is 45 km away. The nearest airport is Geneva Airport, 39 km from Le Sorgia. Offering free WiFi and mountain views, Studio Saint Georges is an accommodation set in Saint-Julien-en-Genevois. Guests staying at this apartment have access to a fully equipped kitchen. The apartment is fitted with a satellite flat-screen TV and 1 bedroom. Geneva is 12 km from the apartment, while Annecy is 35 km from the property. The nearest airport is Chambéry-Savoie Airport, 73 km from Studio Saint Georges. Located between Lake Geneva and Lake Annecy, this hotel is a 15 minutes drive from Geneva Airport. It is sitatuated in the heart of the Vitam leisure centre and guests receive 1 free entry to the one of the leisure area including the water park, fitness centre or indoor rock-climbing. Each guest room at the ibis Styles Saint Julien en Genevois Vitam is equipped with free Wi-Fi, air conditioning and cable TV. They are serviced by a lift and have a private bathroom. Breakfast is served daily and the hotel also provides a 24-hour reception. Conference rooms, team building activities and private recreation spaces are all available. Free parking is available at the hotel, and the Saint-Julien-en-Genevois SNCF Train station is just 3 km away. There is also a local shopping centre and supermarket nearby. Hotel le Soli is located in Saint-Julien-en-Genevois, 9 km from Geneva and just a 2 minute walk from a bus stop servicing Geneva. Free private parking is available on site. The rooms are equipped with a flat-screen TV. Some rooms include views of the mountain or city. Each room comes with a private bathroom. Hotel le Soli features free WiFi throughout the property. Annecy is 27 km from hotel le Soli, while La Clusaz is 38 km away. Located 30 minutes from Genève, the Hotel Restaurant Kyriad Bellegarde-Chatillon is 2.5km from the train station. It offers a 24-hour check-in machine and en suite guest rooms with a TV and free Wi-Fi. The restaurant serves traditional cuisine, which can be enjoyed on the hotel terrace. Geneva Airport and Annecy are 50 km from the Kyriad Bellegarde - Chatillon En Michaille. Free private parking is available. Guests of the Kyriad Bellegarde can enjoy hiking and mountain biking in the surrounding countryside. Hotel Savoie is located in Saint-Julien-en-Genevois in the Rhone-Alpes region, a 15-minute drive from Geneva. It offers en suite accommodation with free Wi-Fi access. The soundproofed guest rooms at the Savoie include air conditioning and a TV with satellite channels (Canal +, BBC). Some rooms feature a balcony. A daily buffet breakfast is served in the dining area or guests can choose a continental breakfast in the guest room. The hotel bar is open daily offering a range of hot and cold drinks, including a wine and champagne list. Savoie Hotel is opposite St-Julien-en-Genevois Train Station. Free private parking is provided for guests arriving by car. Featuring mountain views, Les Gorges offers accommodation with a terrace and a coffee machine, around 16 km from Pelaz. Guests staying at this villa have access to a fully equipped kitchen. The villa includes 3 bedrooms, a living room, and 2 bathrooms with a shower. A flat-screen TV is provided. The nearest airport is Chambéry-Savoie Airport, 72 km from the property. Hôtel Pierre Blanche is located a 5-minute drive from the centre of Bellegarde-sur-Valserine and offers guest rooms and self-catering apartments and studios. All accommodation is provided with free Wi-Fi access. Each room includes a flat-screen TV with satellite channels, a telephone, a Nespresso machine and a kettle. The private bathroom is fitted with a shower. Studios and apartments also have an equipped kitchenette with a stove, fridge and microwave. A continental breakfast can be served in the comfort of your room if you reserve the day before. The hotel has a front desk fax service and 24-hour check-in is possible at an automatic kiosk. Geneva is a 30-minute drive away. Bellegarde-sur-Valserine TGV Train Station is 3.3 km from the property. Free private parking is possible on site. Hotel Cruseilles Preferred hotel ! The Chalet Du Lac is located between Genève and Annecy, 4 km from the A41 motorway. It offers a shaded terrace and garden overlooking the lake. Each guest room at the L'ancolie Chalet Du Lac feature a balcony overlooking the lake or the forest. All rooms are equipped with a TV and free Wi-Fi access, and feature a private bathroom. Guests of the L'ancolie can enjoy fresh, regionally inspired cuisine and a regional wine list in the hotel restaurant. There is also a large lounge area. The Ancolie Chalet du lac, is situated in the Rhône-Alpes countryside and guests can visit the nearby Drosnieres Lake, Saleve Mountain and enjoy fishing, hiking, cycling and tennis nearby. Situated in Beaumont, La Loupiote provides accommodation with free WiFi and flat-screen TV. All units come with a terrace, a kitchen with an oven and a microwave, and a private bathroom. A toaster, a fridge and stovetop are also featured, as well as a coffee machine. The holiday home offers a barbecue. Skiing is possible within the area and a casino is at guests' disposal on site. Geneva is 15 km from La Loupiote, while Annecy is 30 km from the property. The nearest airport is Chambéry-Savoie Airport, 69 km from the accommodation. Hotel Marinet features a garden and a bar in Châtillon-en-Michaille. Rooms are equipped with a flat-screen TV with satellite channels. At the hotel, all rooms are fitted with a desk. The rooms feature a wardrobe. A continental breakfast is available daily at Hotel Marinet. Geneva is 45 km from the accommodation, while Annecy is 47 km from the property. Chambéry-Savoie Airport is 64 km away. Set just 1.3 km from the Swiss border, ibis Archamps Porte de GenÃ¨ve offers free WiFi throughout, luggage storage, a bar, and free newspapers are at guestsâ disposal. The soundproofed rooms at this ibis hotel feature a flat-screen TV with cable channels, air conditioning and a desk. The private bathroom has a bathtub, hairdryer and toilet. A buffet breakfast composed of sweet and savoury dishes such as eggs, fruit salad, yogurts and juices is served every day. Pastries baked on site and fresh French Madeleine cakes are also on offer, as well as a hot beverage and a piece of fruit to take away. Outside of regular breakfast hours guests can also enjoy a lighter option, available from 04:00. ibis Archamps Porte de GenÃ¨ve also features a lift and room for people with reduced mobility. This ibis is a 15-minute drive from the centre of Geneva, a 20-minute drive from the airport and a 30-minute drive from the train station. Free private parking is provided on site. Hotel Archamps Preferred hotel ! The Best Western Porte Sud Genève offers elegant and spacious accommodation just minutes from Geneva city centre. It offers an indoor swimming pool, sauna and fitness centre. The guest rooms at the Porte Sud de Genève are equipped with flat-screen TVs and free Wi-Fi access. Each features a view of the mountains, the city or the garden and has a private bathroom. A continental breakfast is available each morning at the property. Geneva is 9 km from Best Western Porte Sud de Genève, while Annecy is 33 km from the property. The nearest airport is Geneva Airport, 15 km from the hotel. This Auberge is located on the south side of La Mandallaz Mountain. It offers a hot tub, and rooms with a private balcony that overlooks Lake Annecy. Guest rooms at the Auberge La Ferme de Ferrières have a seating area and a work desk. They each have free Wi-Fi access and an en suite bathroom. The Ferme de Ferrieres's restaurant serves regional cuisine, prepared with fresh farm products. There is also a bar and a terrace. Free private parking is available on site at La Ferme de Ferrieres. The Auberge also provides a children's playground, and local leisure activities include hiking. Located in Archamps in the Rhône-Alps region, House 15 minutes from Geneva has a terrace and mountain views. Guests have a private balcony. This holiday home comes with a living room and a fully equipped kitchen with an oven. The holiday home also features a seating area, and 4 bathrooms with a bath and a bidet. Skiing and hiking can be enjoyed nearby. Geneva is 10 km from the holiday home, while Annecy is 37 km from the property. Chambéry-Savoie Airport is 76 km away. Ibis Budget Archamps Porte de Genève is located 2 km away from Archamps. It offers rooms with a TV and it is 10 km away from Lake Leman. Rooms at Porte de Genève are modernly furnished and they all have a desk and a wardrobe. There is a shower cabin directly in the room and a toilet separated by a door. Gare de Saint Julien en Genevois is 4 km away and the Golf and Cuntry Club de Bossey is 4.5 km away. Within 16 km, you can also visit the Botanical Gardens. 24-hour front desk service is available at Ibis Budget Archamps Porte de Genève. Samhotel is just 10 minutes from Annecy in the Haute-Savoie region. Its soundproofed rooms have private bathrooms, flat-screen TVs with satellite channels and free WiFi. A self-service breakfast is available for guests of Samhotel daily from 06:30. The hotel is at exit 18 of the A41 motorway. The surrounding area is composed of the Aravis Massif, Bornes Massif and Le Pont de la Caille. Geneva is a 30-minute drive from the hotel. Guests can access Annecy and Geneva Airport by a bus, which stops 50 metres from the hotel. Located 24 km from Annecy and 29 km from Aix-les-Bains, Chateau de Morgenex is a castle dating from the 13th century. This property offers a terrace and a large garden with views of the mountains and the river. The suite features a seating area, a flat-screen TV and free wired Internet access. The bathroom is complete with shower and a hairdryer. The room offers a fully equipped kitchen with dishwasher, minibar and microwave and guests can also enjoy the outdoor dining area. Activities including horse riding, paragliding, hiking and biking can be enjoyed in the surroundings. Chateau de Morgenex is 8.5 km from Rumilly and 18 km from Seyssel. Free parking is available on site. Offering a barbecue and views of the mountain, Guest Room in Rooftop Apartment is a homestay property located in Collonges-sous-Salève. The room has a TV, a seating area and a private bathroom. For your comfort, you will find free toiletries and a hairdryer. Guest Room in Rooftop Apartment features free WiFi throughout the property. You will find a cash machine at the property. You can play tennis and mini-golf at the homestay. Geneva is 7 km from Guest Room in Rooftop Apartment, while Annecy is 27 km away. The nearest airport is Chambéry-Savoie Airport, 60 km from Guest Room in Rooftop Apartment. Guest accommodation Collonges-sous-Salève Preferred hotel ! Located in Collonges-sous-Salève, Gîtes Le Panorama provides accommodation with seating area. Free WiFi is provided. All units feature a cable flat-screen TV, a private bathroom and a fully equipped kitchenette with a microwave. A toaster and fridge are also featured, as well as a coffee machine. The holiday home offers a terrace. Fishing can be enjoyed nearby. Archamps is 5 km from Gîtes Le Panorama. Chambéry-Savoie Airport is 76 km away. Located in Collonges-sous-Salève, Chalet de TARA provides accommodation with a private pool, free WiFi and private parking. Housed in a building dating from 2016, this apartment is 5 km from the Archamps. The apartment has 1 bedroom and 1 bathroom with free toiletries. There is a seating area and a kitchen complete with a dishwasher and an oven. The apartment offers an outdoor pool. A children's playground can be found at Chalet de TARA, along with a terrace. The nearest airport is Chambéry-Savoie Airport, 77 km from the accommodation. Offering free WiFi and mountain views, Gite la Quintessence is an accommodation situated in Nonglard. With pool views, this accommodation provides a terrace and a swimming pool. This holiday home comes with a living room and a fully equipped kitchen with a dishwasher and an oven. A flat-screen TV with satellite channels is provided. The holiday home offers a barbecue. A children's playground is available on site and both skiing and hiking can be enjoyed within close proximity of Gite la Quintessence. Geneva is 49 km from the accommodation. The nearest airport is Chambéry-Savoie Airport, 51 km from the property. Set in Pringy, La Maison De Promery - Annecy is 7 km from both the old town of Annecy and the lake. La Clusaz ski station is a 40-minute drive away. The property features a private garden, sun terraces, an outdoor dining area and barbecue facilities. Free WiFi and free private parking are available on site. The four-bedroom holiday home is set on 3 levels and features a fully equipped kitchen and a living area with a flat-screen TV and a DVD player. The private bathrooms come with a bath or shower. Some bedrooms are located on an upper floor and others are located on ground floor or lower ground floor. A travel baby cot is provided and beds are made upon arrival. The area is popular for skiing and in the summer guests can enjoy water sports, cycling and hiking. Geneva and its International Airport are less than 40 km away. This Savoyard-style building is located a short distance from Lake Annecy and the main route to Geneva and Paris. Mont Blanc is one hour away by car. 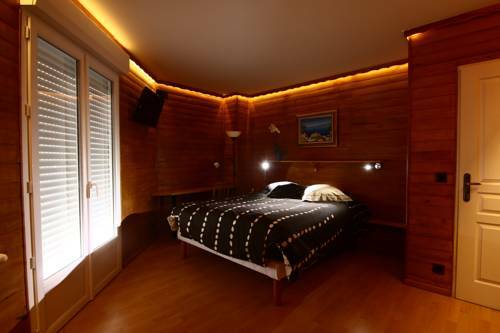 The soundproofed rooms are equipped with satellite TV and an internet access-point. There are 2 meeting rooms and a cosy breakfast room. Located within the Grand Epagny shopping area, this hotel is a 30-minute drive from both La Clusaz and Grand Bornand ski resorts. There are many restaurants located within 150 metres of the property. The hotel offers free outdoor parking and another underground car park. Located close to motorway A41 and the expressway to Annecy, Premiere Classe Annecy Nord – Epagny offers free Wi-Fi access and free private parking on site. Lake Annecy is 10 km away. Rooms offer a flat-screen TV with satellite channels and each room has a private bathroom with a shower. Restaurants and shops can be found within 1 km of the property at the commercial centre. Aix-les-Bains is 35 km away and Geneva is 38 km from the hotel. Annecy Train Station is 5 km away and Lyon-Saint Éxupéry Airport is a 75-minute drive away. Featuring a restaurant and a terrace, Auberge de Motz is located in Motz. Each room features views of the mountains, a flat-screen TV and a private bathroom with bath or shower and free toiletries. Bed linen and towels are included. Breakfast is available at an extra charge. Guests can enjoy traditional food with a twist made with seasonal and local produce in the property's restaurant. Activities in the surroundings include skiing, cycling, tree climbing and horse riding. The property offers free parking. Annecy is 37 km away. Hotel Metz-Tessy Preferred hotel ! Hotel The Originals Annecy Aéroport is located in Metz-Tessy. This air-conditioned property features a 24-hour front desk, a bar and a restaurant. Free WiFi access is available throughout the hotel. All rooms include a desk and a welcome tray with a selection of tea, coffee and milk. The private bathrooms come with a bath and free toiletries. For guests who wish to explore the local sites, the Chateau d'Annecy Museum is a 14-minute drive from the property Annecy - Haute-Savoie - Mont Blanc Airport is just 2 km from the hotel and Annecy Train Station is 5 km away. Hotel Poisy Preferred hotel ! Featuring free WiFi, ibis budget Annecy Poisy is situated in Poisy. This 2-star hotel has air-conditioned rooms with a private bathroom. At the hotel, all rooms are fitted with a desk and a flat-screen TV. All units include a wardrobe. A continental breakfast is served each morning at the property. Geneva is 41 km from ibis budget Annecy Poisy, while Annecy is 5 km from the property. Chambéry-Savoie Airport is 44 km away. Guest accommodation Thoiry Preferred hotel ! Best Western Park Hotel Geneve-Thoiry offers eco-friendly accommodation in the heart of Gex. There is free WiFi, a 24-hour front desk and a free shuttle service to Geneva Airport, CERN centre and Palexpo exhibition centre available upon request. Palexpo exhibition centre is 12 km away. The hotel has a contemporary design and is made from environmentally friendly materials. Solar panels are used for hot water and other eco-friendly devices are used for heating and air conditioning. Rooms and suites are spacious and fully equipped with kitchenette, TV and en suite facilities. WiFi is provided and room service is available for lunch and dinner. Best Western Park Hotel Geneve-Thoiry is located just near the Switzerland border and is close to the nuclear research organisation CERN. Free secure underground parking is available. Best Western Park Hotel Geneve-Thoiry also offers free access to the hotel's fitness centre. Guests can also rent bikes on site. Situated in Argonay, 7 km from Annecy and 38 km from Geneva, B&B Hôtel Annecy offers comfortable guest rooms, free WiFi access and free private parking. All of the double and twin rooms have air conditioning, a flat-screen TV with cable channels and a private bathroom. An all-you-can-eat buffet breakfast is available every morning and consists of an array of fruit juices, hot drinks, breads, pastries and conserves. Megève is 39 km from B&B Hôtel Annecy. The nearest airport is Saint Exupery Airport, 85 km from B&B Hôtel Annecy. Featuring a 24-hour front desk, HotelF1 Annecy is a hotel located in Argonay, 45 minutes' drive from Chambéry. Free WiFi is available throughout. Rooms include a flat-screen TV. Guests have access to a shared bathroom. Breakfast can be enjoyed and vending machines are available on site. Guests can purchase microfibre towels at the hotel at an extra cost of EUR 3 each. Geneva is 30 km from hotelF1 Annecy, while Annecy is 5 km from the property. Lyon - Saint Exupery Airport is 85 km away. Free private parking is available at the hotel. Located at the foot of the mountains of the Jura, Hôtel balladins Genève/Saint-Genis-Pouilly is only a 20-minute drive from the centre of Genève, a 5-minute drive from CERN and a 10-minute drive from Geneva Airport. All rooms have an LCD TV with canal + channels and free WiFi access. The private bathroom is complete with shower and toilet. Guests can relax in the lounge and enjoy the onsite restaurant "Le Gamaret", which focuses on serving fresh produce. The restaurant is closed on Friday night, Saturday and Sunday. Palexpo is a 14-minute drive from the property and Geneva Train Station a 20-minute drive away. Free public parking is possible on site. Below here is the hotels map of Savigny. Names and details of Savigny hotels can be shown on the map clicking on the prices icons.